On many planes, the mantis is a small creature. 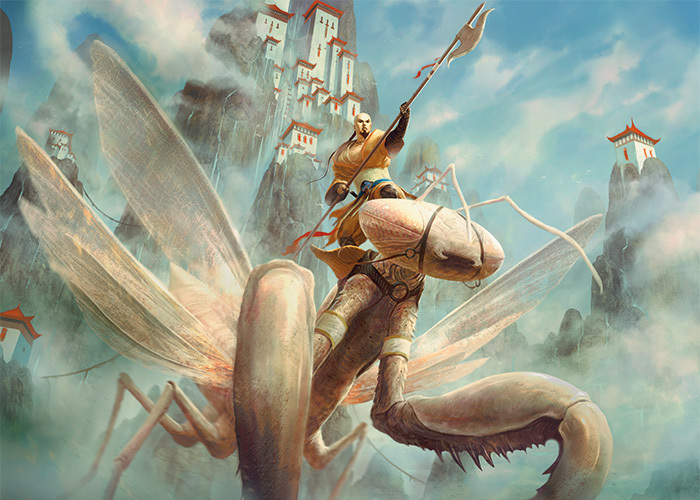 On Tarkir, the mantises are larger than oxen and native to the mountainous region the Jeskai control. 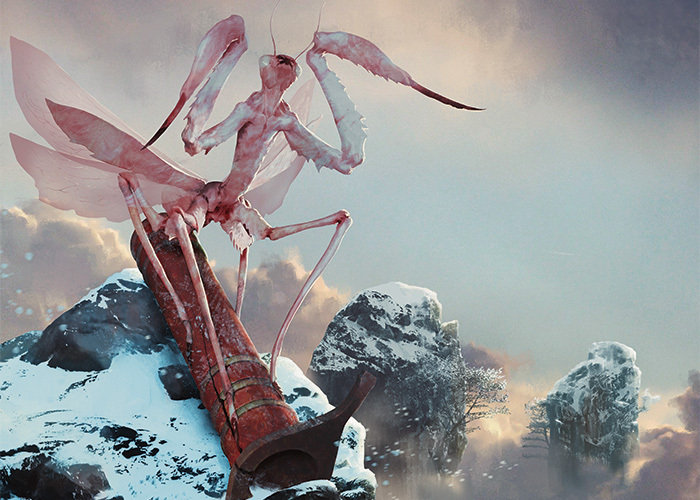 Atop a red-roofed Jeskai tower, a monk named Kuhnde stood on his mantis and looked over the valley. A cold wind blew across his skin; he did not shiver, nor did he move. His mantis twitched beneath him, its arms always moving and head craning toward invisible prey. Mantis riders knew their mounts owe them no allegiance. Even a mantis ridden for years would consume a rider who lost focus for only a moment. There are many Jeskai styles. Riverwalk imitates flowing water; Dragonfist, the ancient hellkites; and Flying Crane, the wild aven of the high peaks. No name exists for the ceremony, but within the Jeskai, it is among the most important, defining events of one's life. Kuhnde began training for his mount when he was very young, and showed great potential as a student. When he was a few years old and just starting to read, representatives from the different strongholds and disciplines met with him. He was given a few minutes of understanding of each different style and told to try his best. The master of Sage-Eye Stronghold valued stealth, quickness, and cunning, while the master of Dirgu Stronghold brought with him several bladed weapons for Kuhnde to use. An aven master met with Kuhnde to see how adept he was at moving through the air as he leapt. The Riverwheel Stronghold master assessed Kuhnde as he performed their variation of Riverwalk magic, while the Cori Mountain Stronghold master was there to assess Dragonfist maneuvers. The School of Pearls, while not having a stronghold, watched the young boy attempt to manipulate a dozen pearls while he fought. 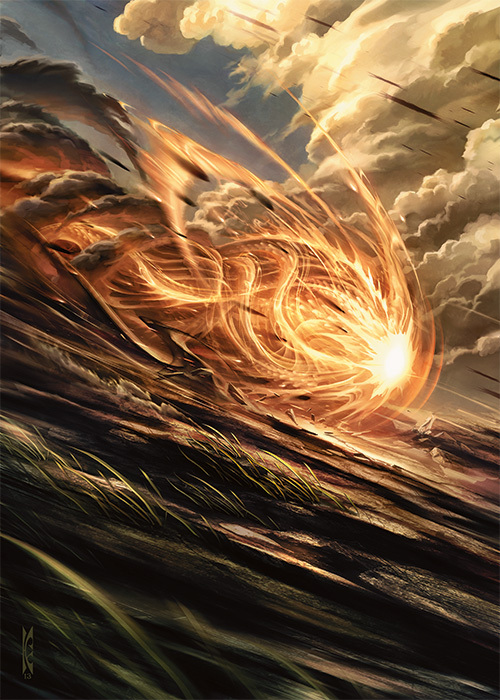 He was tested on magic and identified the Jeskai's preferred types—soulfire, mistfire, and bloodfire—easily avoiding deathfire and vitalfire. The masters were all disappointed. He was competent in all the disciplines, although not an expert, but they all recognized in Kuhnde the skill set that was required of being a mantis rider. Kuhnde met his mount that day, a mantis that was tethered to the ground by other riders. He was told to never let down his guard. One of the riders showed Kuhnde his own mantis and explained that he had trained it for years, fed it daily, and kept it clean. The rider removed one of the mantis's tethers and the insect lashed out, cutting the rider's hand. Kuhnde was scared when that happened, but the rider explained why Kuhnde was destined to be a mantis rider. "There is no one way to tame a mantis," the rider explained. "It takes parts of all of the disciplines to learn how to stay forever vigilant and control your mantis, sometimes while also fighting another foe. You need to be aware of every variable, anticipate all outcomes, and in a mere second react to what is and what might be. You will be riding, with tenuous control, a creature that is your greatest threat." Kuhnde had felt honored. He was young and filled with the promise of prestige. As he began to train, he saw how unique his path would be. Each mantis rider was able to work with the specific discipline needed to ride the mantis. Some required more study in the Riverwheel tradition to stay atop their mounts while others spent time at Dirgu Stronghold and learned how to keep themselves balanced when using a spear. It took Kuhnde twenty years to learn how to ride his mantis. Although he stood tall watching the valley below, he focused on where he shifted his weight, rested his spear, and pulled his single rein. He was vigilant, reacting when his mantis quickly moved its head or buzzed its wings. Its wings produced a high-pitched, barely audible whirring sound in flight, and only the Jeskai were normally quiet enough to hear one coming. Kuhnde understood his mantis enough to know what the changes in the pitch and speed of the buzzing meant—his mantis was restless and wanted to move. Kuhnde allowed the mantis to fly freely, steering it only when it flew too close to the tower windows where other students took lessons. There was always the danger, no matter how trained one was, that a mantis would no longer take orders from its rider. One of the first mantis riders brought his mount into a village, so it is said, and the mantis was so fueled by anger that, despite its master's commands, it rampaged and killed several people. Mantis rider never allowed their mounts to get close to others, for fear of a similar event. Kuhnde's mantis turned its head, alerting him to movement near the base of the mountain. Whatever it was, it was disguised by a concealment spell, and Kuhnde knew well enough to anticipate a terrible foe cloaked in that magic. Jeskai use the obscuring magic for the element of surprise, to disguise their identity, or scout foreign lands. They also use it as destructive ambush magic against their enemies, so Kuhnde was well aware of the danger it could present to the monastery. The orb continued to blaze up the side of the mountain and Kuhnde repositioned his feet, signaling the mantis to intercept. They dove toward the amber ball of energy. As they got closer it diverted its path to race up the mountain, but not toward them. Kuhnde tensed and held his spear. He signaled the mantis to go lower, so they could lead the energy ball away from the monastery. He dared not get too close or attack it—he had no idea what lay within. The mantis veered down toward the valley, toward the lakes below. Kuhnde looked back, trying to gauge distance to the concealed enemy, but saw it had returned to climb the summit. He shifted his weight to turn around the mantis and braced himself to move with the abrupt shift, lest he would fall to the ground. They flew beside the fast-moving sphere close the ground. Kuhnde felt the mantis begin to buck, so while he applied pressure with one foot to the back of the mantis's head he jabbed at the orb with his spear. There was a loud screech, one the monks in the monastery would have heard, and the orb dissipated. A phoenix emerged and attacked. It was a large bird, the size of Kuhnde's mantis. It burned brightly as it slashed with its claws. Fire rolled off of the phoenix's wings like liquid, leaving trails of burning earth, but the phoenix had presented its underbelly. Kuhnde made the mantis take the attack, and it slashed at the phoenix. It cut the phoenix with its longer claws, and blood and flame emerged from the wound. The phoenix screeched again and flew higher. Kuhnde understood it was attempting to get away, but it was flying toward the monastery tower, most likely to land and try to regain its strength. A bird landing on the monastery would be no cause for alarm—but that bird was a force of nature and left fire in its wake. Kuhnde watched as the phoenix headed toward the tallest tower, which housed this stronghold's library—a building least welcoming to an invader of fire. The scrolls in the library were not important, of course, but the information written in them needed saving. Kuhnde hadn't needed to train from scrolls much during his training and he knew some of the djinn that guarded them had never read their contents, so he didn't value them highly. But he knew that, for many in the Jeskai, the words on the scrolls were more precious than gold was to the Sultai. Kuhnde would lay down his life protecting them. He goaded his mantis to fly faster, ignoring the freezing winds that rushed around him. Injured, the phoenix flew slower. Kuhnde struck again with his spear, impaling the phoenix near where the wing met the body. The phoenix reacted, crying out a screech of pain and igniting its body in flames. Kuhnde knew he'd been hit with the flames, but his flesh was so numbed by the cold he couldn't feel the pain. His mantis began to fall and he knew why before he saw—its wings were burning. He grasped his mantis's body as they fell alongside the phoenix, which dropped due to its wounds. The phoenix and the mantis hit the side of the mountain and slid rapidly toward its base. Kuhnde held on tight when they slid down the slope, but relaxed his muscles when they stopped, minimizing injury. His mantis was burned, its wings and a large portion of its carapace gone. Its insides leaked onto the mountainside. 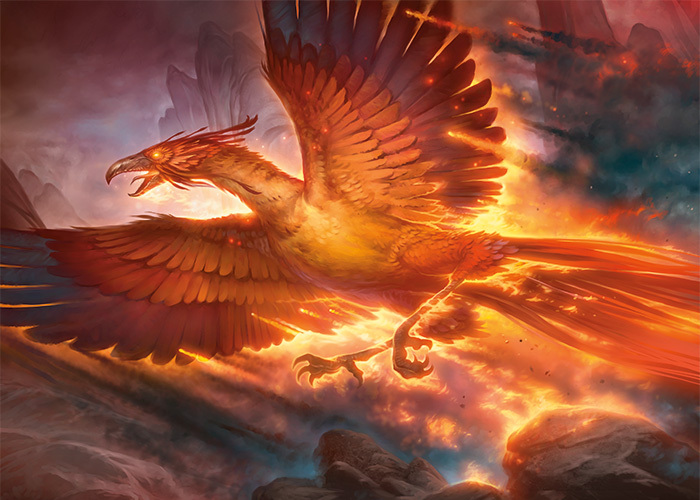 The phoenix was next to a boulder, upside down, one of its wings obviously broken. The massive bird was unable to right itself. Kuhnde turned back to the mantis. He approached it, his companion for twenty years, as it lay dying. The mantis, unable to comprehend its situation, struck out at Kuhnde with the same chattering and head movements, as it attempted to kill and consume the man before it. Kuhnde did not take the attempt personally. He had trained not to. Despite the sharp pain of injury he felt in his shoulder, he picked up his spear. With a quick, precise motion, Kuhnde impaled the mantis's head to end its misery, although the creature's mandibles continued to feel around for human flesh for a few moments. Kuhnde turned to the phoenix. It was still a threat to the monastery, even injured, and killing it would only cause it to be reborn, stronger even. So Kuhnde took all his knowledge, training, and years of discipline and began to make a new path. He approached the phoenix and used his spear to help the bird right itself. The bird snapped at him, but he struck the phoenix on the beak with the shaft of his spear. The bird was stunned, then ignited itself in anger. Kuhnde again struck it on the beak. It cawed, but that time more in pain than anger. Kuhnde knew much from training a mantis, but even then he only trained to ride one specific mantis. He had never learned how to tame a phoenix, but he knew, given the time, he would master a new way. Even if it took many years.